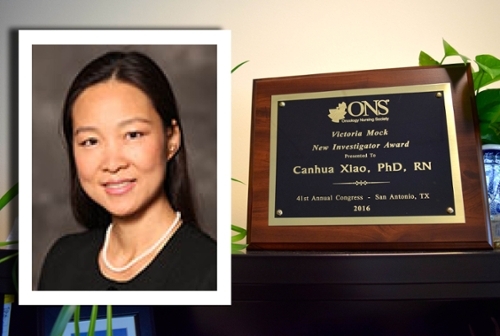 Winship member Canhua Xiao, PhD, RN has received the Victoria Mock New Investigator Award from the Oncology Nursing Society. The award, given at the annual Oncology Nursing Society Congress held April 28-May 1, recognizes the contributions of new investigators in building a scientific foundation for oncology nursing practice. Xiao is also the recipient of a $1.5 million National Institutes of Health/National Institute of Nursing Research R01 grant to study epigenetic mechanisms of inflammation and fatigue in head and neck cancer patients. Co-investigators on the grant are: Jonathan Beitler, MD, Deborah Bruner, PhD, Andrew Miller, MD, Paula Vertino, MD, Alicia Smith, PhD and Karen Conneely, PhD.